I have wanted an outdoor couch forever. Well at least for the last 3 or 4 years since they became popular again. But they are insanely expensive and I don't need the chairs that go with it as our deck really isn't that big - although it sure looked huge when all we had was a barbecue on it. Somehow our patio table's leg got bent over the winter and it was not fixable. 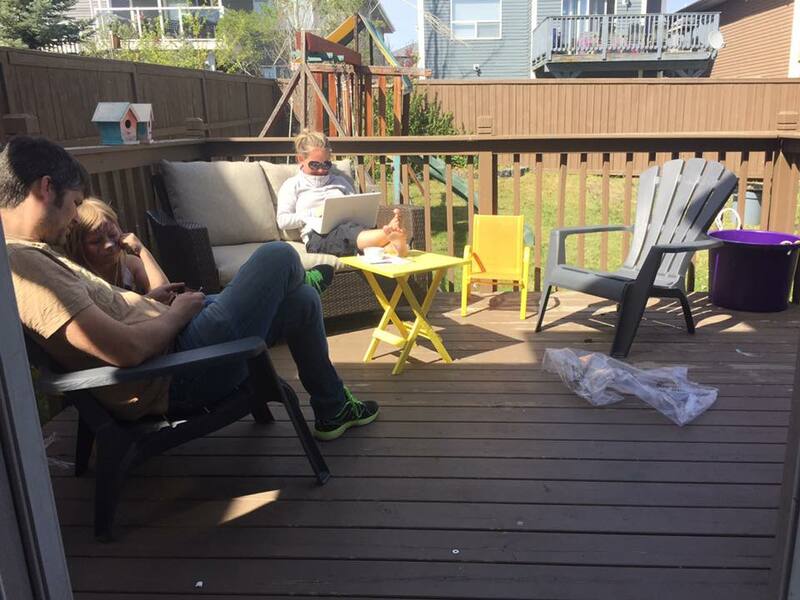 We got rid of it and I sold the chairs that we bought at Target before it closed and just used our adirondack chairs on it. It was nice and I liked it but I wanted a couch. Something to lay on and read a book or watch my iPad or just hang out on that was comfortable and relaxing. I can't understand how people justify spending more on outdoor furniture then I have spent on all 3 of my indoor living rooms combined. Yes I am cheap and shop sales and kijiji to get stuff as cheap as I can but spending $3500 on outdoor is just to much for us. I had spent Sunday morning looking online at Jysk where they had a reasonable price set but we would have to sell the chairs and I wasn't really into that. Home Depot, IKEA and Walmart had nothing in my price range and my last hope was Canadian Tire. Low and behold, they had a nice looking wicker couch in a nice colour for a reasonable price. Greg and Penelope were going to look at it on the way to get groceries that afternoon. Greg didn't like it too much in the store and wasn't confident that it would stay. 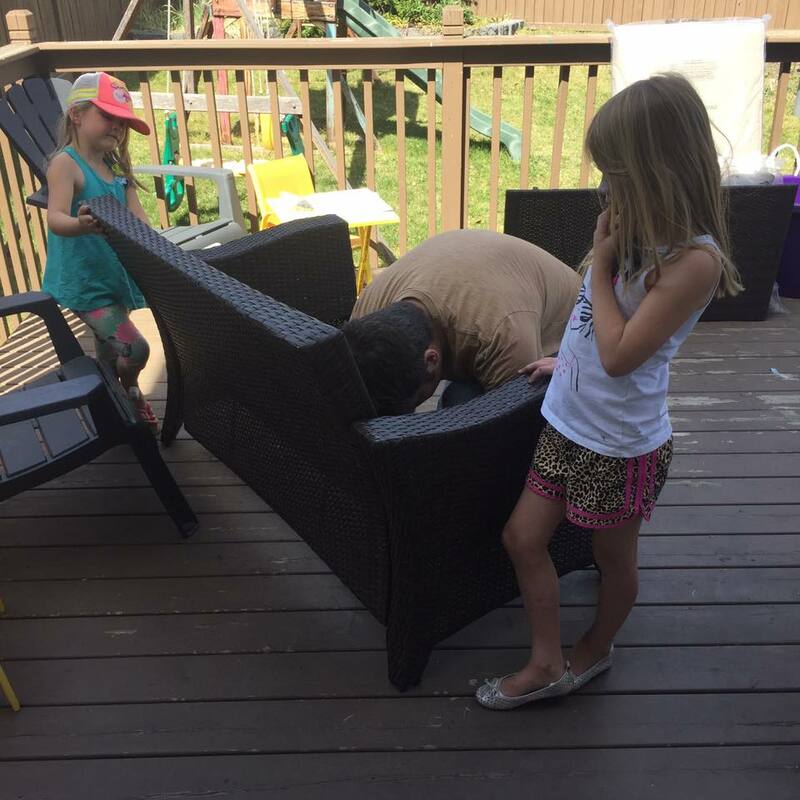 The girls helped him build it. They helped take the plastic off and were so excited to sit on the couch. It looked much nicer on our deck then it did in the store and that was probably because it was sitting next to all the really nice, expensive ones. 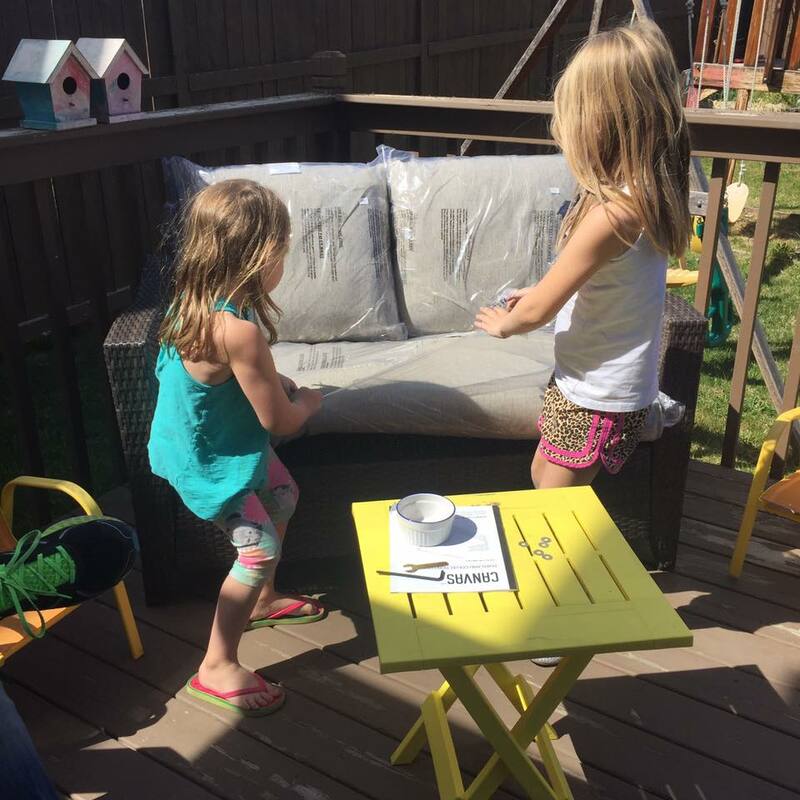 We spent a good portion of our Sunday sitting on our deck and enjoying the beautiful weather that we have been spoiled with. We loved our patio set but we definitely weren't the people who ate outside every day. The kids ate lunch outside but as far as suppers went, it was rare. I bet we ate out there 4x last summer and I might be generous with that number too. On Monday morning after I got home from running some errands + grabbing some starbucks, I came home and laid on my couch while I waited for Penelope to finish school. It was wonderful. I joked with Greg when he was setting it up on Sunday that this could be an early Mother's Day present for me. 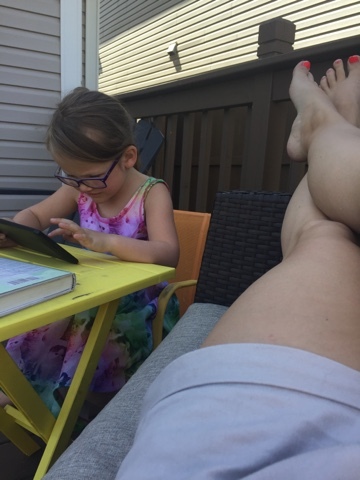 Later that afternoon, I read a book and Penelope played her Shopkins game on her tablet while we enjoyed time on our deck. 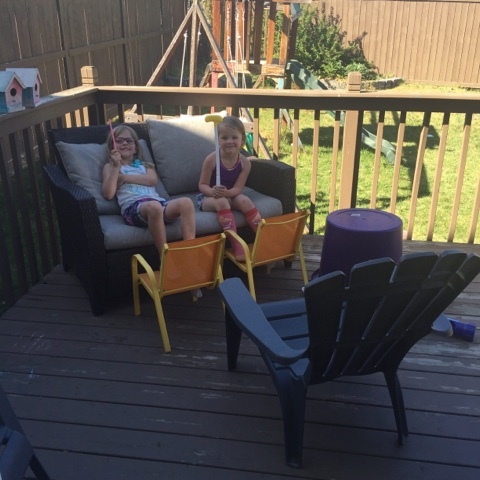 The girls love hanging out on the deck now and they use their little chairs and the little yellow table we got last summer as their make shift picnic table and they love it even more then they did the big table anyways. We have enjoyed our new outdoor living space very much and all i need now is a really cute outdoor pillow to put on there for when I lay down on it - the wicker is not very comfortable hahaha. I look forward to many more mornings, afternoons and evenings spent outside on our little slice of heaven.